Pardon the pun, but Captain Oil isn’t one of those mobile games that’s going to set the world on fire. But the more I play it, the more I think about the place where it was made. That almost never happens. Captain Oil was made by a dev studio called Game Cooks, which sends its games out into the world from Beirut, Lebanon, smack dab in the middle of a region better known for intractable ethno-religious conflicts and constant sudden violence. And while the physics-based arcade shooter may not be all that remarkable compared to the Angry Birds and Candy Crush Sagas of the world, it’s worth noting that it comes from part of the world where the practice of game-making is still very much in its infancy. I spoke with the dev studio’s co-founder Lebnan Nader a few months ago when he was in New York City for the Mobile World Conference. Nader knows that Game Cooks’ output needs improvement but paints a portrait of an organization still finding its legs. “In terms of mobile gaming, we were the pioneers not only in Beirut, but in the region. There were already games on the web but we didn’t have anything for mobile. 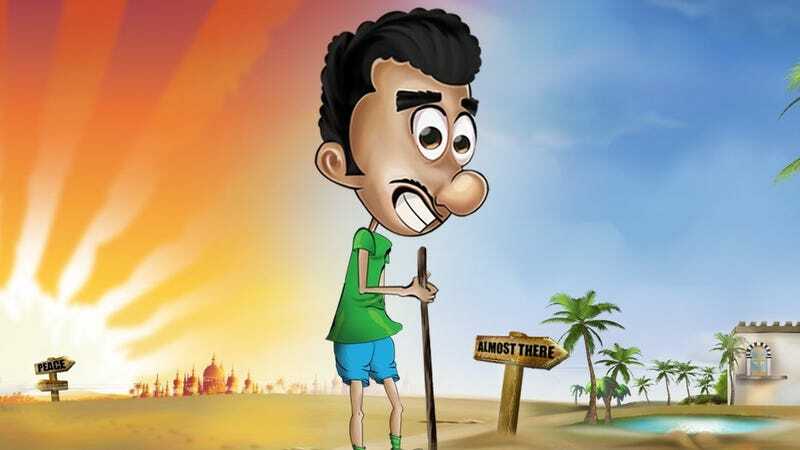 We were the first to launch a mobile game in Arabic in the region,” he told me. Nader: “When you want to develop a game, people say, ‘What are you doing? Are you playing your life away?’"
This means that Captain Oil and another new release called N.E.R.D.S. are the products of a dev studio incrementally learning to apply more style and polish to their efforts. “All of our team is more or less made up of technical developers. They did not develop games before,” Nader said. “We kind of started together and learned together how to develop a game. We learned a little bit more. What is a game? What is an engine? Stuff like that. They had the background. They were excellent coders. But none developed a game before. So we kind of did that together." And while they’re constantly figuring what they’re doing, they’re also seeding the very idea of game development in an area where most people play games made elsewhere. Parental angst isn’t the only emotional drama the Game Cooks have had to deal with. When they were making their first game, all they wanted was to introduce a goofy endless runner set against a backdrop that reflected where they lived. “We had just started our startup in the middle of Arab Spring. We wanted our first game to have a nice message for people. What better message than peace?,” Nader said. “We just want peace. In the material for all the Facebook ads and stuff that we did, the concept was, ‘We’re not for war, let’s play.’ You get a character who is Middle Eastern and he’s running for peace. He blocks the tanks. He goes and says, “We’re not for war. Let’s play.” Sure, it had some political overtones but only the most innocuous kind. “In our region you have both Muslims and Christians,” Nader continued. “We come from a Christian background. We see stuff a little bit differently maybe than some other people. When we did Run For Peace, we used the peace sign as our logo. I Googled around and made a lot of effort to check that it’s not offensive to the Muslim religion. Before we launched the game, I sent it for testing to a couple of editors I know. And one of them massacred us in his article, saying that, 'They’re using this because this is actually not a peace sign; this is a sign for Christianity. They are putting this in the game because they want Christianity to be more [prominent] in the Middle East. Users, be careful. Do not download Run For Peace. It’s Christian done for Christians. It’s not for us.' We got killed in that article." Game Cooks’ titles have been cartoony and whimsical so far, unlike so many games that have sequences set in the region. When the Middle East shows up in first-person shooters like Call of Duty or Medal of Honor, it’s usually shown as a foreboding part of the world where radical terrorism can fester. Countries like Pakistan have taken offense to that, moving to ban games that portray them in such a light. The average American or European citizen doesn’t hear gunfire that often. They don’t encounter sudden flashpoints of long-running hostilities in their day-to-day lives, so fantasies where one plays the roles of soldier or insurgent might be easier to accept. “I think people from the US relate to the Middle East as a war zone, as a terrorism zone,” Nader offered. “They do not see the potential of this area beyond that image.” But, for Nader and crew, automatic rifle fire is less of a fiction and more of a reality. I asked him if Game Cooks would ever want to make grimmer, more realistic games like CoD or MoH, maybe to tell their side of the story as relates to the violence that’s never that far away. Nader told me that, in the U.S. and in Europe, there were Middle Eastern people—Arab people, specifically—who were proud of having an Arabic game when Run for Peace came out. “But they acknowledge it because they’re proud, not because the game is good or not,” he laughed. “If you read the reviews in Arabic, you could see people saying, “I’m very proud of you guys. You did an Arabic game. But nobody says it’s a good game.” They’re getting to that, folks. Just give them a little time.